This page provides instructions on how to set up and use the OptiTrack active marker solution. Note that this guide is specific only to the pre-programmed OptiTrack active LED marker kit, which includes the Base Station and active LEDs that are powered by the Tags. The guide will not work with third-party LEDs. This guide covers the active components that have firmware version 1.0 or above. Requires Motive 2.0 or later versions. 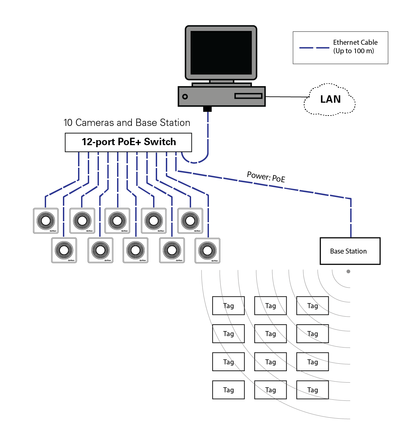 This solution is supported for Ethernet camera systems (Slim 13E or Prime series cameras) only. 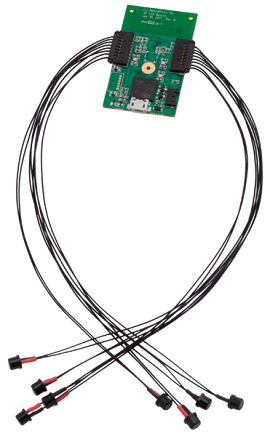 We strongly recommend updating the firmware on the active tracking components: Base Station and Tags. Please contact support for instructions on how to update the outdated firmware. Active components that were shipped prior to September 2017 uses the firmware v0.8. v0.8 Base Station works only with v0.8 Tags. Firmware v0.8 requires an eSync to synchronize the base station and the mocap system together. Whenever v0.8 Base Station is power cycled, all of the v0.8 Tags must be power cycled as well. Active components that were shipped later than September 2017 uses the firmware v1.0. Requires Motive 2.0 beta 2 or later versions. No longer requires eSync for synchronizing the Base Station with the camera system. Support for user-defined camera framerates. The illumination time of active LEDs is synchronized to the camera exposure time. v1.0 Tags are compatible with v1.0 Base Stations only. v0.8 Tags needs to be power cycled each time you close and relaunch Motive. v0.8 Tags needs to be power cycled each time system frame rate has been changed in Motive. 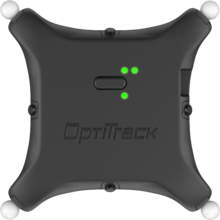 The OptiTrack Active Tracking solution allows synchronized tracking of active LED markers using an OptiTrack camera system. The active tracking solution consists of the Base Station, the Tags, and the active LED markers. The Base Station connects to the camera system and sends out signals to the Tags, allowing precise synchronization between camera exposure and illumination of the LEDs. Together, they allow Motive to recognize the unique illumination patterns and assign unique IDs to respective active markers in the software, and with individually labeled markers, more stable rigid body tracking can be achieved; the markers will never be mislabeled and unique marker placements will no longer be required for distinguishing multiple rigid bodies. Sends out radio frequency signals for synchronizing the active markers. Must be connected to one of the switches in the camera network. Connects to a USB power source and illuminates the active LEDs. Receives RF signals from the Base Station and correspondingly synchronizes illumination of the connected active LED markers. Emits 850 nm IR light. 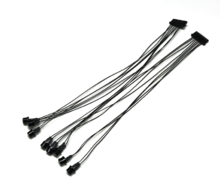 4 active LEDs in each bundle and up to two bundles can be connected to each Tag. A standalone trackable object that has 8 active markers embedded with diffusers on 4 of them. It also includes an internal re-chargeable battery that can support up to ~10hrs of run time on a single charge. The puck can be attached onto any type of objects to measure its positional and rotational tracking information. Like the active Tags, active pucks also receives RF signals from the Base Station and correspondingly synchronizes illumination of the connected active LED markers. 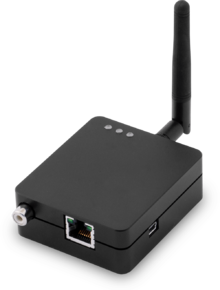 Active tracking is supported only with the Ethernet camera system (Prime series or Slime 13E cameras). For instructions on how to set up a camera system see: Hardware Setup. Connects to one of the PoE switches within the camera network. For best performance, place the base station near the center of your tracking space, with unobstructed lines of sight to the areas where your Active Tags will be located during use. Although the wireless signal is capable of traveling through many types of obstructions, there still exists the possibility of reduced range as a result of interference, particularly from metal and other dense materials. Do not place external electromagnetic or radio frequency devices near the Base Station. Connect two sets of active markers (4 LEDs in each set) into the Tag. Power the Tag. Use a micro USB cable to connect the Tag to a power source. Power requirement is between 3.1V - 5.5V; measured at 100mA @ 5V with all LEDs on for 2ms every frame at 180 Hz. Once powered, you should be able to see the illumination of IR LEDs from the 2D reference camera view. 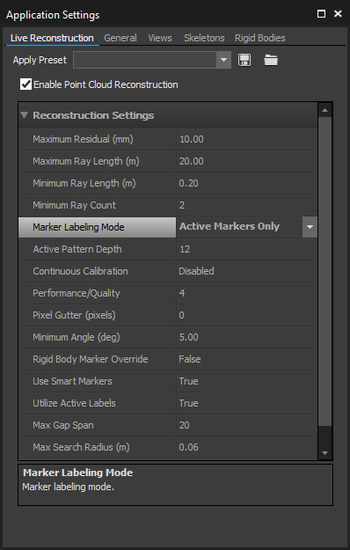 (Default: Passive) The Marker Labeling Mode setting determines whether the point cloud engine reconstructs passive markers, active markers, or both passive and active markers. 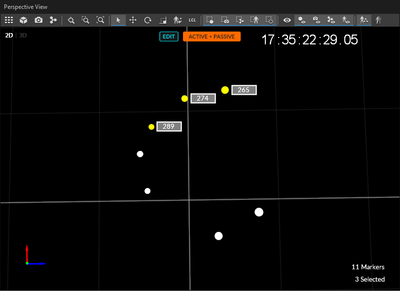 When Motive is configured to one of the active marker tracking modes, it will be indicated on the perspective view pane. (Default: True) This should be set to true for stable active marker tracking. When enabled, the point cloud engine uses only the active marker centroids that have the matching active IDs to create a reconstruction. Even if the tracking rays intersect within the allowable residual offset, any centroids with mismatching IDs will be rejected and will not contribute to the reconstruction. (Default: 12) This setting sets the complexity of the active illumination patterns. When tracking a high number of rigid body, this may need to be increased to allow for more combinations of the illumination patterns on each marker. When this value is set too low, duplicate active IDs will be produced. In most applications, the default value can be used. For tracking only active markers, LED settings on all of the cameras can be reduced down to zero. This will disable the IR LEDs on the cameras which may slightly reduce the IR noise in the background; improving the stability of the overall tracking. For tracking active components, you may want to increase the exposure settings on the cameras so that they have a better visibility of the markers. Optimal settings will vary depending on the size of the capture volume as well as marker-to-marker distance on the tracked objects. The rule of thumb is to monitor the camera view while adjusting the camera settings, but in general, the exposure can be increased beyond 500us. (Default: white) This setting is located under the view tab in the Application Settings pane. The color assigned to this setting will be used to indicate actively labeled markers in Motive. The color can be changed if you need a way of differentiating passive markers from active markers directly on the viewport. Once the above settings have been configured, active markers will be reconstructed and tracked in Motive. From the unique illumination patterns, each active marker gets labeled individually, and a unique marker ID gets assigned to the corresponding reconstruction in Motive. These IDs can be monitored in the Live-reconstruction mode or in the 2D Mode. To check the marker IDs of respective reconstructions, enable the Marker Labels option under the visual aids ( ), and the IDs of selected markers will be displayed in the 3D viewport. The marker IDs assigned to active marker reconstructions are unique, and it can be used to point to a specific marker within many reconstructions in the scene. Rigid body definitions that are created from actively labeled reconstructions will search for specific marker IDs along with the marker placements to track the rigid body. Further explained in the following section. Rigid body definitions created from actively labeled reconstructions will search for respective marker IDs in order to solve the rigid body. This gives a huge benefit because the active markers can be placed in perfectly symmetrical marker arrangements among multiple rigid bodies and not run into labeling swaps. With active markers, only the 3D reconstructions with active IDs stored under the corresponding rigid body definition will contribute to the solve. If a rigid body was created from actively labeled reconstructions, the corresponding Active ID gets saved under the corresponding rigid body properties. In order for the rigid body to be tracked, the reconstructions with matching marker IDs in addition to matching marker placements must be tracked in the volume. If the active ID is set to 0, it means no particular marker ID is given to the rigid body definition and any reconstructions can contribute to the solve. › Q : Active markers are flickering from both the 3D viewport in Motive. 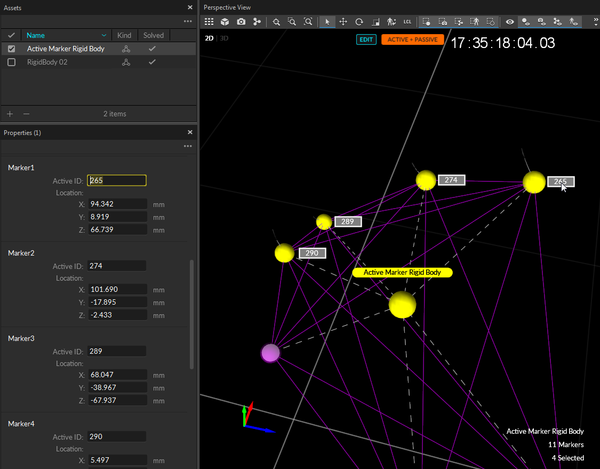 Make sure Motive is set to tracking Active markers under the reconstruction settings. The Marker Labeling Mode must be set to either Active Markers Only or Active and Passive Markers. If flickering occurs on markers of a specific Tag only, try power cycling it. If it tracks fine afterward, the Tag is using v0.8 firmware. This page was last modified on 13 August 2018, at 13:36.